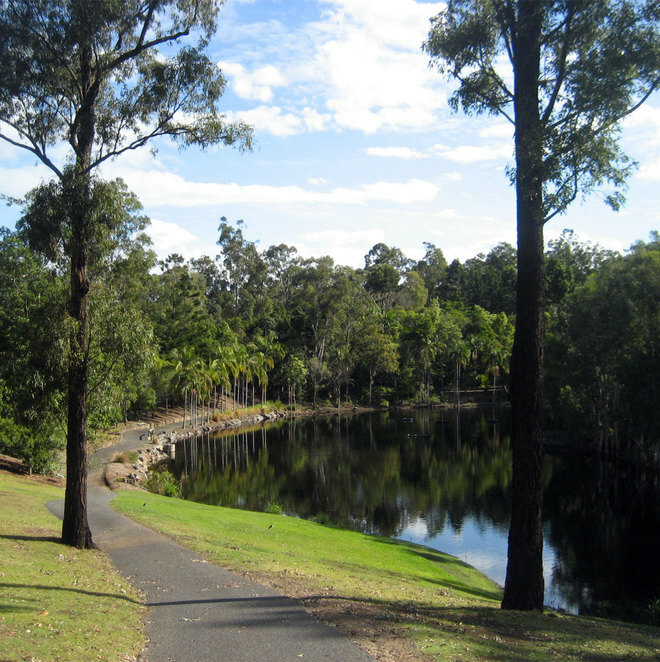 The Brisbane City Council is rapidly adding more and more paths on Mt Coot-tha and improving the various scenic spots that are there. One of the best new hikes is a circuit that goes from the Brisbane Botanic Gardens (on Mt Coot-tha Road) up to the summit and back down the summit path visiting many spots of interest on the way. 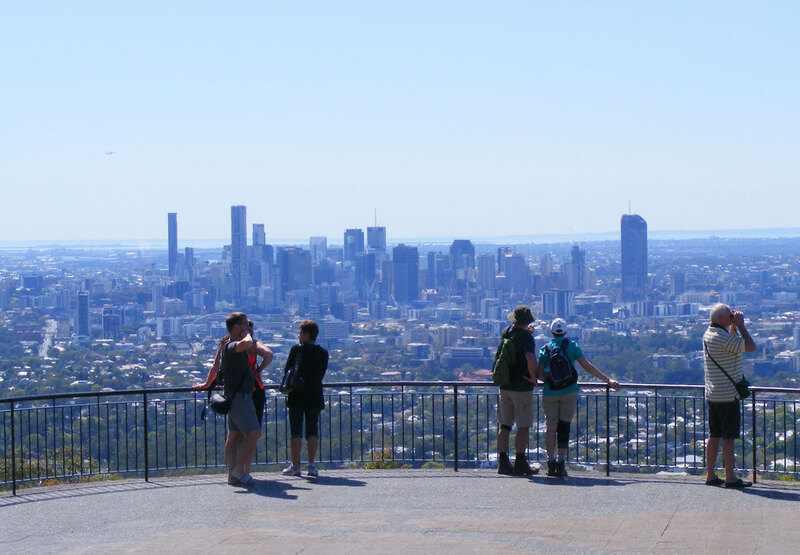 The hike that I will describe consists of all the highlights while also keeping the focus on getting to and from the summit of Mt Coot-tha. 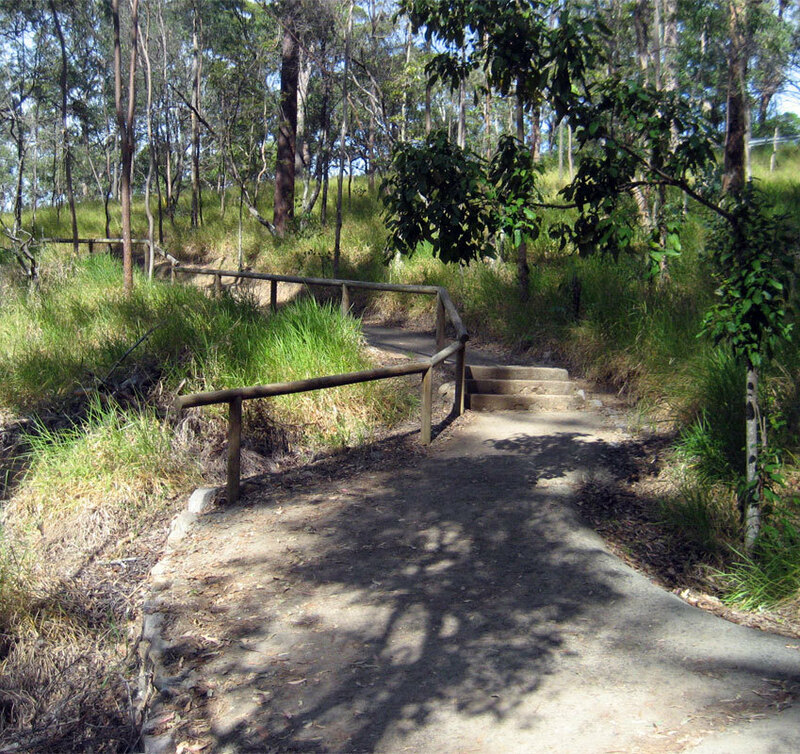 The path I will describe will go to two lookouts with views of Brisbane, visit unique Australian plants and flowers, walk beside a lake, have a cafe at the half-way point and at the end, stop in to see a falls and aboriginal art, pass through World War II history and complete a great circuit. Be aware, of course, that I will be skipping some spots on this walk and focusing on the highlights. This walk is described in a clockwise direction, however if you want to explore the gardens you might consider walking the other way around and ending up at the gardens. After all you can spend hours walking around just the gardens themselves. The Brisbane Botanic Gardens has an unfortunate name because it is usually confused with the botanic gardens in the city. Even Google gets it wrong. 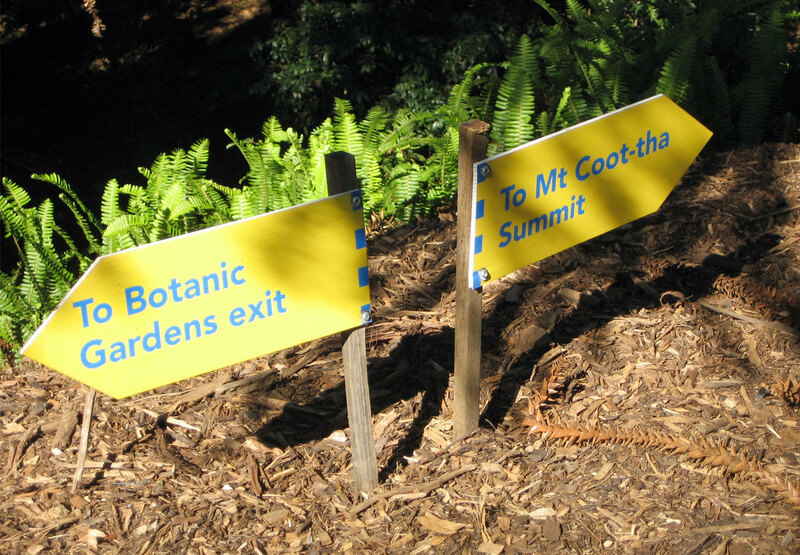 But the Brisbane Botanic Gardens on the slopes of Mt Coot-tha is usually just called the Mt Coot-tha Botanic Gardens by locals. This beautiful sprawling gardens feature lakes, lagoons, a dome for tropical plants, a Japanese Garden, a kids play area and much much more. 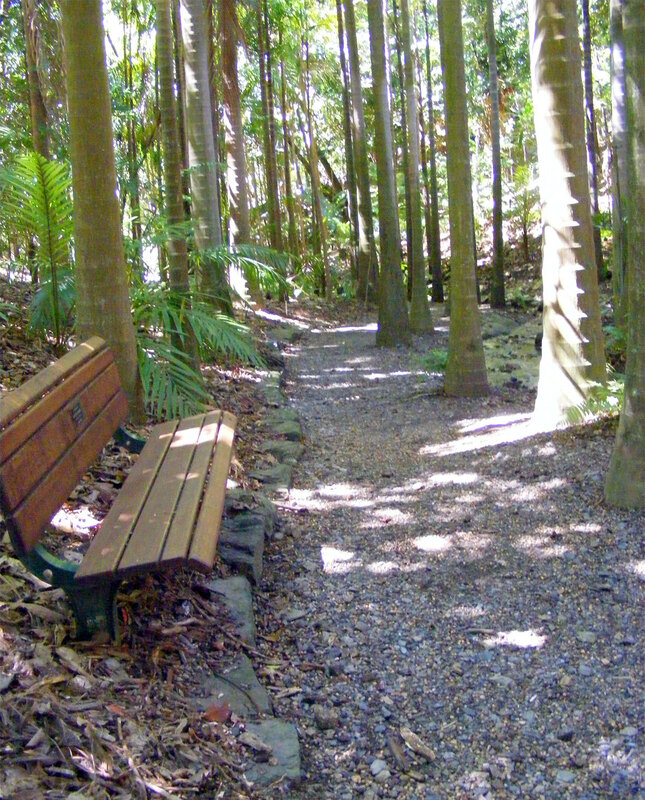 Recently the Brisbane City Council opened a walking path from the back of the gardens to the summit. 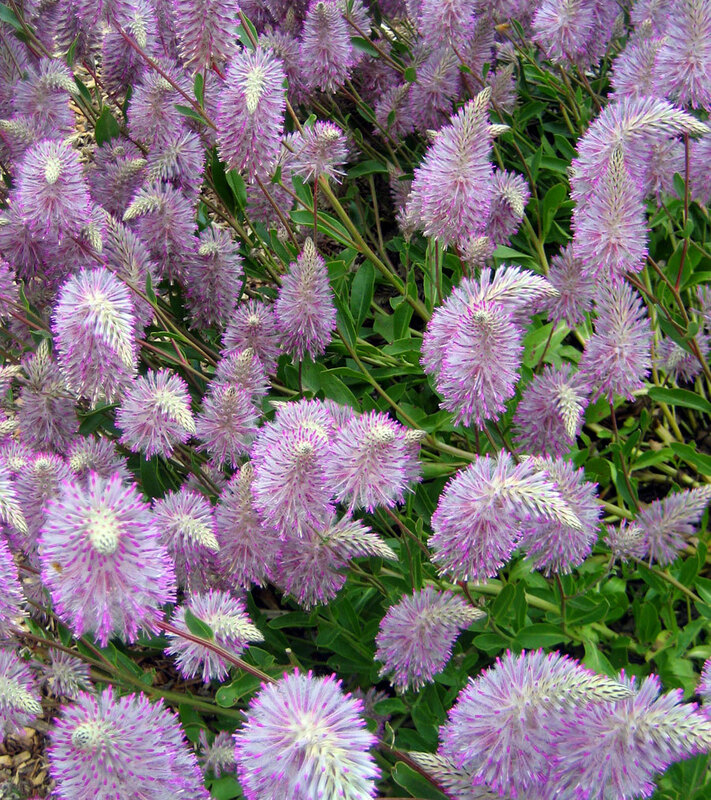 I am going to focus on how to visit some interesting parts of the gardens while doing this walk. This walk that I am describing is customised and doesn't follow the recommended or signed walk. There is of course no reason to follow my directions pedantically as they are only a suggestion. Getting to the gardens is fairly easy. There is plenty of parking at the gardens themselves and across the road as well if the main car park is full. There are a couple of buses as well. 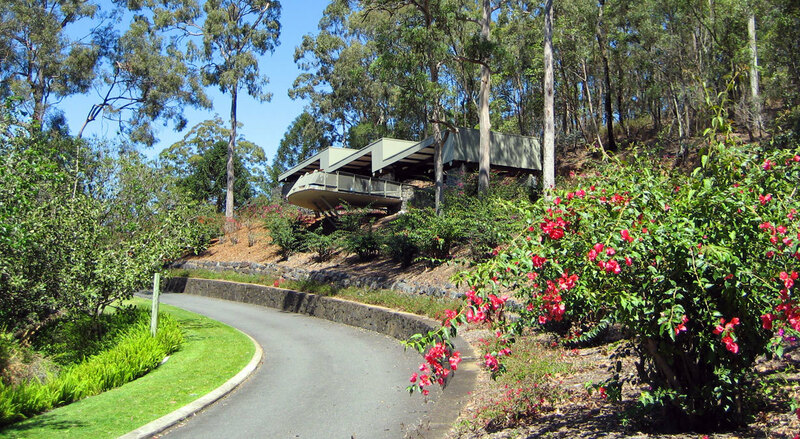 In particular the 471 bus goes from the city to both the gardens and to the lookout. Be aware that the gardens are open from 8 am to 5:30 pm, so this walk can only be done during those hours. But you can visit the other Mt Coot-tha tracks at any time. When entering the gardens through the main entrance it is a good idea to pick up a map. You will see signs to Mt Coot-tha Summit that tell you to go left. We are going to ignore these and follow the road to the right. This is the shorter route and it also takes us directly to the Lookout in the gardens. 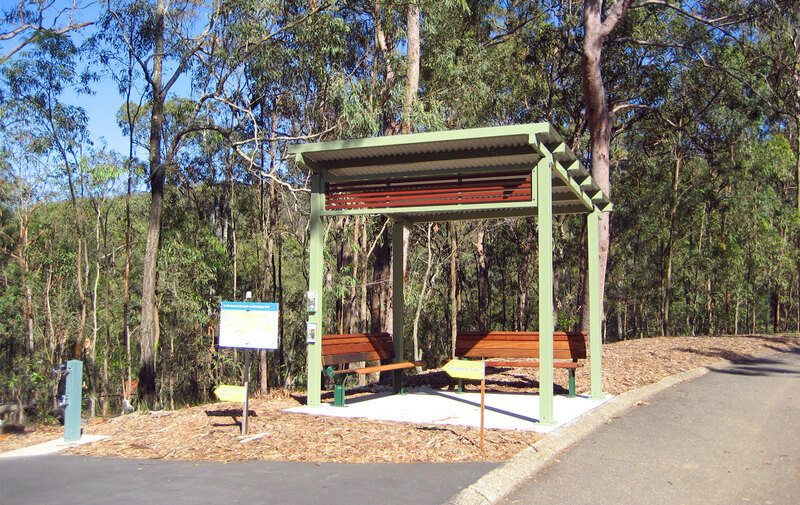 This wonderful covered area is actually a great place for a picnic, but its main feature is the views of the city. We will get a much more expansive view from the top of the mountain but it is worth stopping here as well. After the lookout, you will come to an intersection in the road. 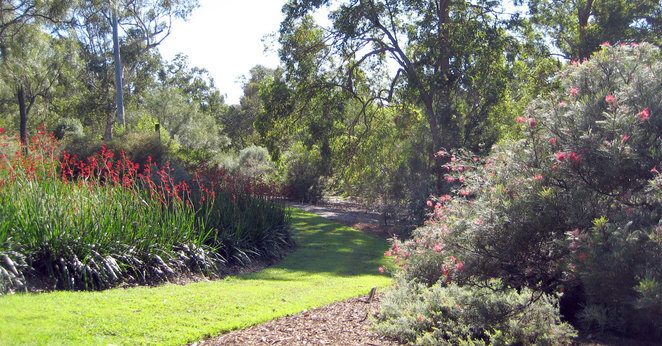 Turn right and keep heading towards the back of the gardens which features Australian native plants. 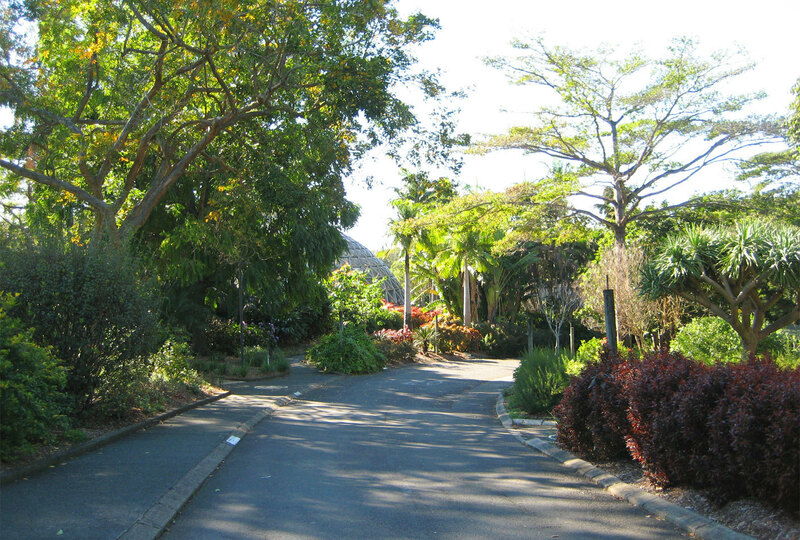 Along this road on your left you will find one of my favourite little garden areas in Brisbane, the Australian Flower Garden. 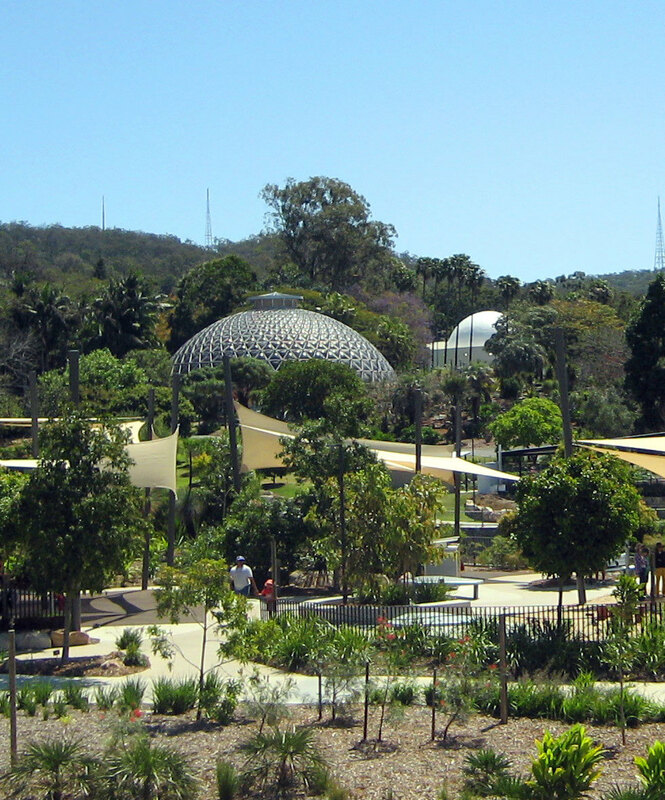 This area features a wide range of Australian flowering plants designed to provide blooms all year round. No gardener visits this area without wondering why they don't have more Australian flowers in their own garden. Not only do they come in a wide variety of colours and shapes, most Australian flowers require less water and care than other flowers. 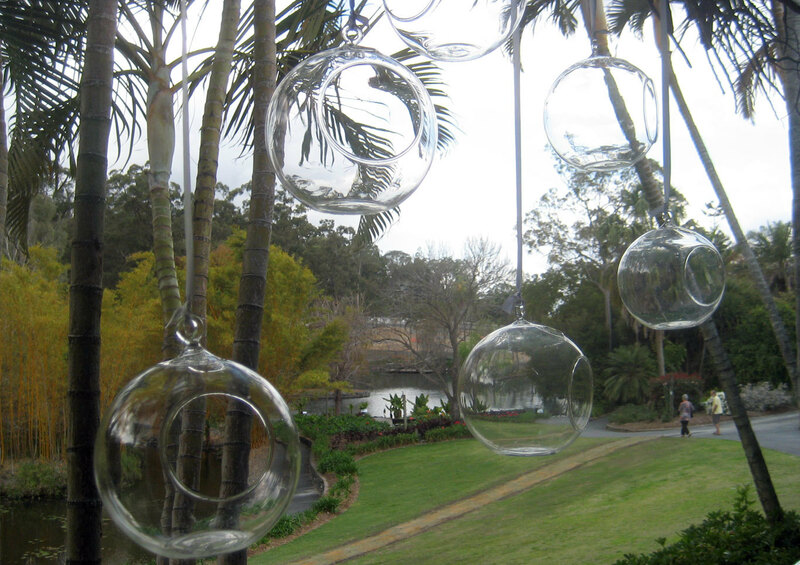 Just beyond the Australian flower garden you will find the lake. At this point I recommend going the long way around and heading to the other side of the lake and walking along the path that heads through the Melaleuca Wetlands. This is a pleasant walk through a beautiful shaded area. It will end up at the far end of the lake. The path is not straightforward and if you picked up a map of the gardens, it will be most useful here. But even without a map, you are trying to find the path that takes up back up to the road. The worst case scenario is you continue around the lake, get back on the road and backtrack up to the back of the gardens. We have now reached the far end of the gardens. Just on the other side of the road at the back of the gardens is a fence. Look for a gate in this fence. It is easy to spot as there is also a little covered shelter here as well. This is the start of the Citriodora Trail. The track goes both to the left and to the right. 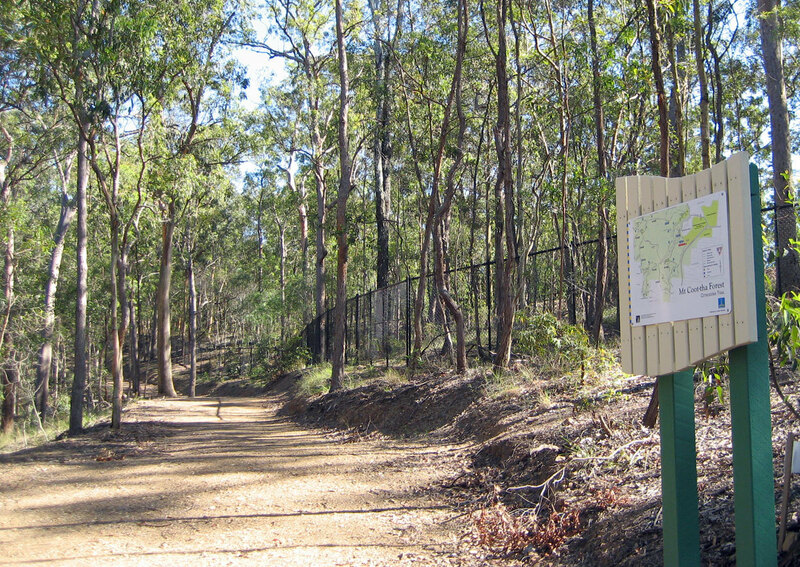 If you go left it will take you to the Lookout Trail which is one of the steepest tracks up Mt Coot-tha and is highly recommended for people looking to do some exercise. Instead we will turn right which is the shorter and easier route up the mountain. 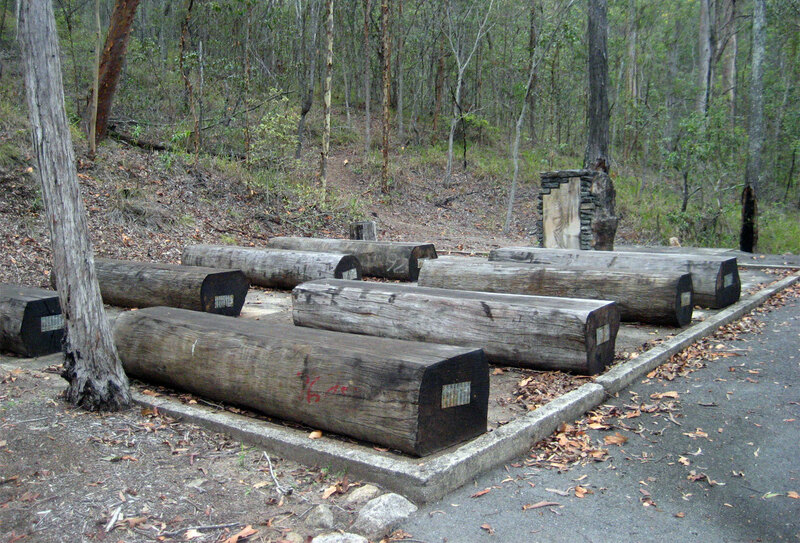 The Citriodora Trail ends up at the ring road on Mt Coot-tha. You will see lots of people walking from there along the road, which is a little dangerous. Instead walk across the road where you will find the Mahogany Trail and turn left in the direction of The Summit. The Mahogany Trail is a newly opened path that, along with the Summit Track, creates the summit circuit. Follow this path to the end where you will once again meet up with the road. From there turn left to The Summit. It is just a short safe walk along the side of the road to the lookout at The Summit. Finally we made it to The Summit, also more accurately known as Brisbane Lookout. This is because it isn't actually the highest point of Mt Coot-tha but it is the spot with the best views. Also here is a tourist shop, the Kuta Cafe and an elegant restaurant. If you are feeling tired this is the place to jump on a bus back to the start of the walk. The Kuta Cafe is nice enough, but be aware that while the food is good it is a little overpriced and the service can be slow when there is a crowd on the mountain. One time it took us an hour to get a cup of coffee. Most people stick to coffee and ice cream here. The way back down the mountain to our starting point involves following the Summit Track. The walk starts at the same spot where the Mahogany Trail ended. Walking in the direction we are going, this track is downhill and there are some drink fountains along the path. 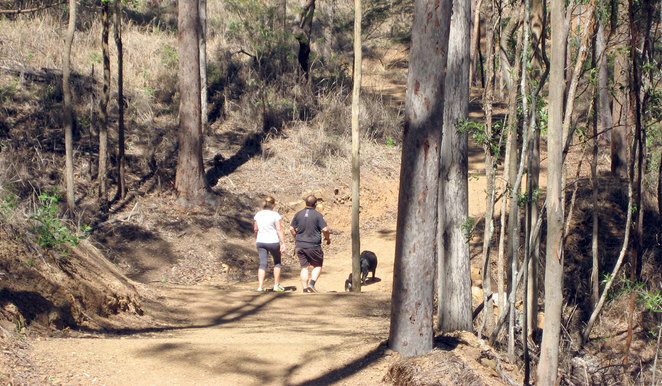 This is the most popular track on Mt Coot-tha, and for most people, a fairly disappointing walk. But this is because they walk past many of the interesting diversions on this track which I will describe below. 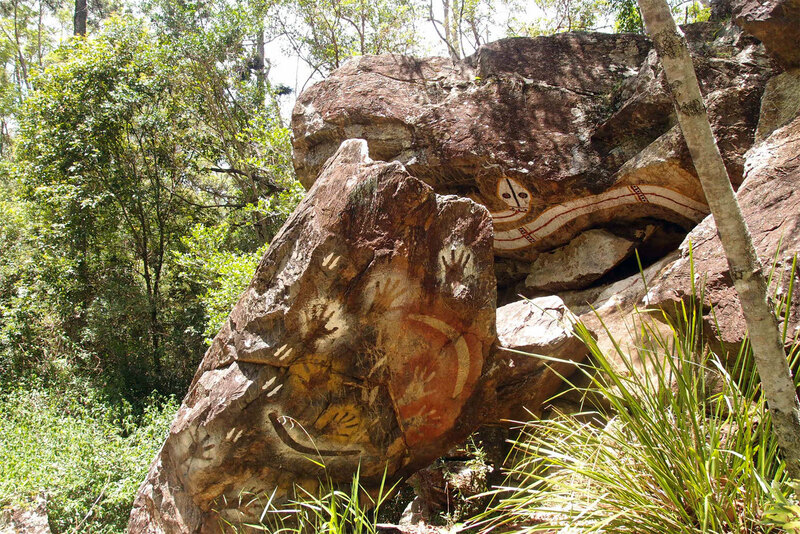 One track that many people just walk past is the Aboriginal Art Trail that leads up to JC Slaughter Falls. This track is a loop, so you walk up the track and back down to the Summit Track a bit further along. Look for a track that leads off to your left. It is easy to walk past it even though it is signposted. The art trail was constructed in 1988 for the Australian Bicentennial and features a number of different indigenous artworks. Some have unfortunately been poorly maintained. But the main gallery at JC Slaughter Falls is worth the walk. You can view the gallery from the viewing platform just about the falls. The falls themselves rarely have much water going over them. You may be lucky if you visit the falls after a big rainstorm, otherwise don't expect too much. 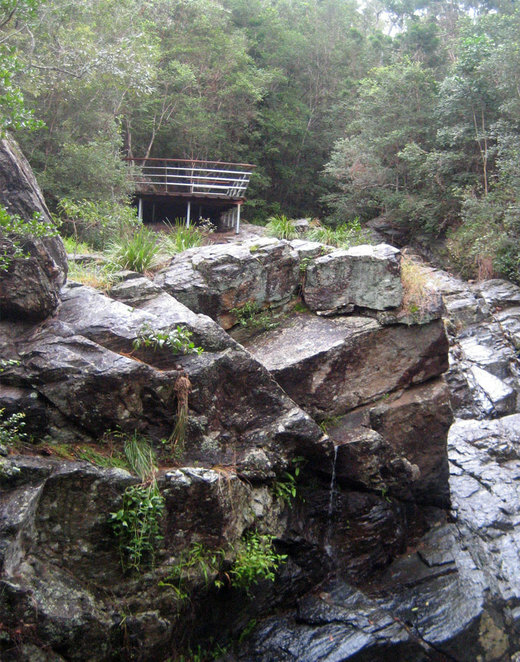 After the Aboriginal Art Trail joins back onto the Summit Track, it is only a short walk to the JC Slaughter Falls Picnic Area. Near the end of the Summit Track you will be walking along a bitumen road. To the left of the road you will see the track divert off to the left across the creek. Follow this track and you will come to the very end of the picnic area where you will find a barbecue spot and picnic shelter with a little bit of history. 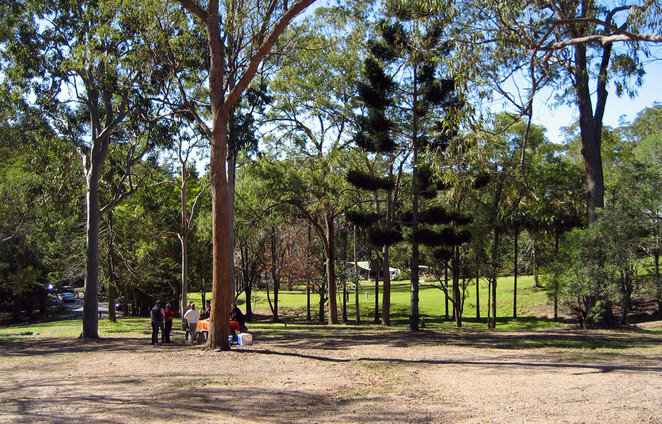 Up until World War II there were no roads up Mt Coot-tha. I have talked to some people who have walked the mountain back in the 1930s when they would mostly follow the goat tracks. 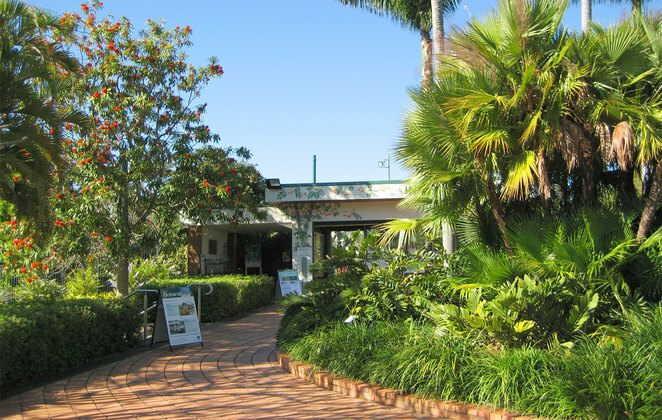 But during the Second World War, US forces made Brisbane their main base and set up camp in several locations around the city. One of these was Mt Coot-tha. So they built a road and cleared a large camp area. 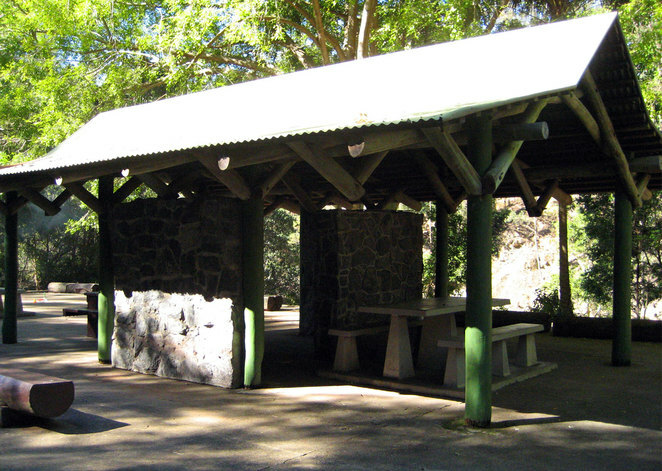 The picnic shelter pictured above is built on a concrete slab laid down for the mess hall of the camp. 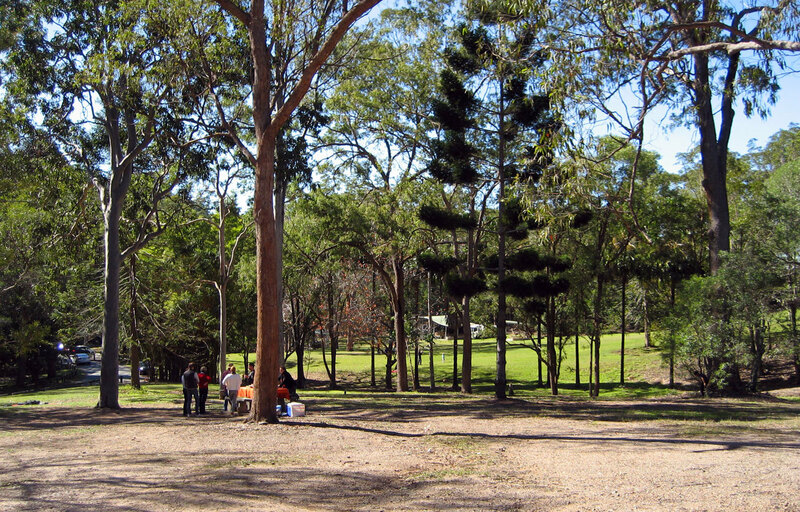 The picnic area in total is quite large with plenty of places to stop and rest, have a picnic or a barbecue. One interesting area to visit in the JC Slaughter Falls Picnic area is the Bush Chapel. This was originally constructed for US forces to hold mass. Looking at old photos it seems that it has been reconstructed and not exactly the same as the original chapel, even though it is in the same location and does look similar. To get to the Bush Chapel, look to the right as you walk through along the road for the JC Slaughter Falls Picnic Area. You will see a bitumen path leading up a small hill to your right. It will be clearly marked with a sign saying Bush Chapel. Though in the direction we are walking the words on the sign won't be visible until you pass the entrance. The chapel is basically a set of logs and a stone altar on a concrete slab. There are no walls, roof or anything else. But it is still a lovely spot to visit. These days it doesn't appear to be used for regular services, though I have seen photos of people holding weddings at the chapel. Mt Coot-tha is a spot best visited with an active attitude and knowledge of where to visit. There are many paths on the mountain and new ones are being opened all the time. 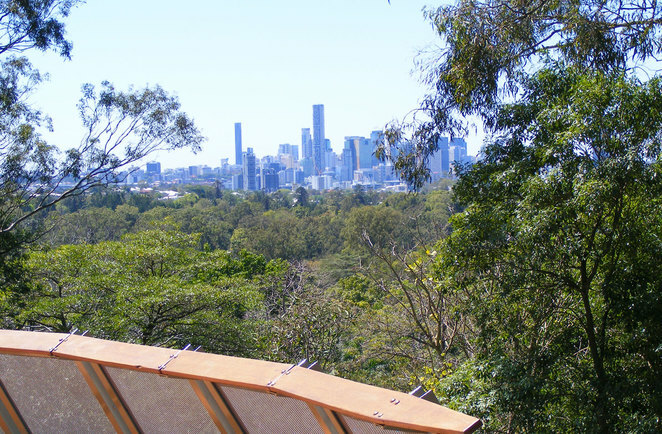 This walk should be the must do walk in Brisbane for both locals and visitors.